Offering unparalleled value and superb quality, the M-Series are high performance 12.1", 15", 15" Sunlight Readable, 17", 19" and 22" widescreen color TFT flat panel monitors specifically designed for harsh industrial environments including Class I & II, Division 2 Hazardous Locations when mounted in a NEMA enclosure. M-Series Displays now carry IECEx and ATEX Zone 2/22 certificates of approval. * Check factory for availability of M1500SRT and M2200W stainless front panels - not always stocked and may take 6 weeks or more for delivery - video modes up to 1680 x 1050 with 16 million colors. A 5-wire analog touchscreen is available that offers RS-232 or USB interface capability. M-Series monitors are housed in heavy duty steel chassis with powder coated machined aluminum bezels. The monitors are certified to NEMA 4/4X/12 standards, are UL/CUL listed, meet CE requirements and are RoHS compliant. All M-Series monitors are shipped with a power input wiring receptacle, VGA cable, touchscreen cables, mounting hardware, manual and driver software. 12.1" Industrial Monitor IECEx/ATEX 2/22 Approved. Standard with power input wiring receptacle, VGA cable, touchscreen cables, mounting hardware, manual and driver software. 15.0" Industrial Monitor IECEx/ATEX 2/22 Approved. Standard with power input wiring receptacle, VGA cable, touchscreen cables, mounting hardware, manual and driver software. 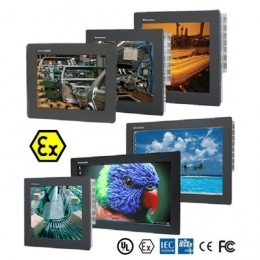 15.0" Sunlight Readable Industrial Monitor IECEx/ATEX 2/22 Approved. Standard with power input wiring receptacle, VGA cable, touchscreen cables, mounting hardware, manual and driver software. 17.0" Industrial Monitor IECEx/ATEX 2/22 Approved. Standard with power input wiring receptacle, VGA cable, touchscreen cables, mounting hardware, manual and driver software. 22.0" Industrial Monitor IECEx/ATEX 2/22 Approved. Standard with power input wiring receptacle, VGA cable, touchscreen cables, mounting hardware, manual and driver software.